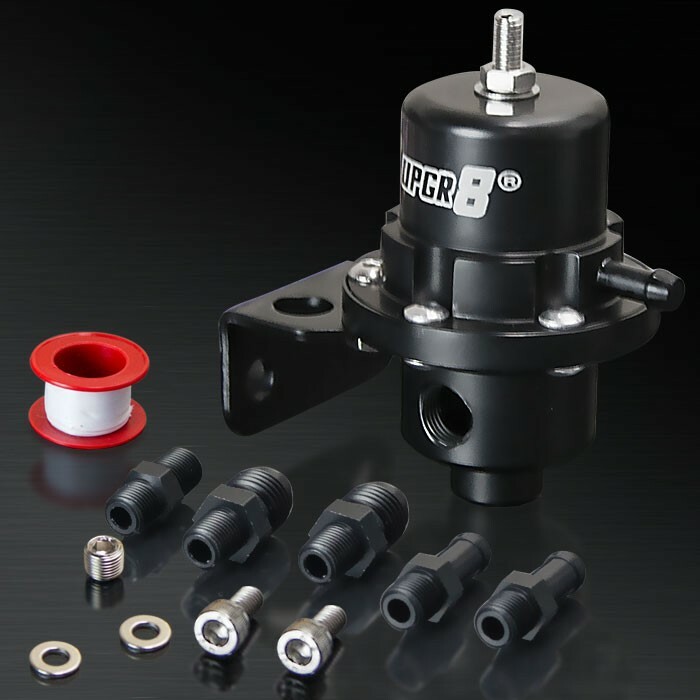 The UPGR8 Fuel Pressure Regulator is manufactured from CNC T6061aluminum, and will ensure stable pressures are supplied with the oversized diaphragm. This design has been proven to maintain the required pressure levels in high boost applications. Injectors and fuel pump upgrades require a larger flow setup then the stock fuel pressure regulator is able to supply. The stock regulator is preset from the factory at a standard fuel pressure setting which cannot be adjusted and will restrict the tuning potential of the car. The UPGR8 Fuel Pressure Regulator is manufactured from CNC T6061aluminum, and will ensure stable pressures are supplied with the oversized diaphragm. This design has been proven to maintain the required pressure levels in high boost applications. It is unique in that the discharge port is changeable, letting you tailor the regulator return volume to match the fuel pump. The vacuum reference is at a 1 : 1 ratio. For every pound of boost on turbocharged or supercharged application results in a 1-pound rise in fuel pressure. You can adjust from a range of 30 PSI to the maximum the fuel pump can delivery.